Happy 1st Anniversary! For Small Hands/Montessori Services Giveaway! Thank you for your continued support for our blog and your excitement as we celebrate our blog’s 1 Year Anniversary! Congratulations to K on Winning the Montessori Apron from Handmade Montessori! We greatly thank all who entered to win the Montessori Apron! Thank you for supporting Handmade Montessori! K., we hope you greatly enjoy your new apron! I’m sure Karla from Handmade Montessori can accommodate your request for a red flowers waterproof apron! If you weren’t the lucky winner, consider visiting Handmade Montessori and purchasing one of her fabulous aprons! Congratulations to Jamie on Winning the Montessori Placemat from How We Montessori Shop! Thank you so much to all who entered to win the Montessori Placemat! Thank you for helping us promote our blog and How We Montessori Shop. It really is a wonderful company filled with unique and quality items. It seems a few of you were eyeing up the matching and language sets and the lock box. If you weren’t the lucky winner, remember that the Easy Clean Montessori Placemat has FREE international shipping, making it affordable no matter where you live! $50 Gift Certificate to For Small Hands/Montessori Services! I am really excited to work with this company for the giveaway. I’ve been ordering materials for my school from them for many years and now purchase materials for my daughter from the company. They have a huge selection of child-sized tools, great toys, art supplies, children’s books, adult resources, and so much more! If you’ve not heard of this company, I’m really excited to introduce you to it. If you do know of this company, I’m sure you’re anxious to get your name in for the giveaway! They have two branches: For Small Hands is geared towards parents and Montessori Services is geared towards teachers. A $50 Gift Certificate would be so much fun to spend for this company! You’ve probably seen A. using materials from For Small Hands/Montessori Services in previous posts such as Crawling towards Practical Life. Our most loved items are the small garden hand tools and the small metal pail, although we also greatly love books such as Hands Can and Global Babies, and I think the baby hairbrush is absolutely perfect for fine, baby hair. We also use the polka-dot pitcher and tongs on a daily basis. Recently, For Small Hands/Montessori Services sent me some musical instruments to review. I was so excited to do so! We only have a few musical instruments and it was on my wishlist to obtain more for A. I’m quite particular about the toys that make it into our home as I really try to limit the toys. That means the toys that are in our home are usually made of natural materials and are good quality. The musical instruments from Montessori Services fit both these criteria and had the bonus of being from South America. I love travelling and the cultural diversity of our world so what better way to introduce this to my toddler than through musical instruments! We picked up A.’s maracas when we were in Dominican Republic so it is very fitting that we continue the international collection. On my dream wish list was to have a goat hoof shaker. 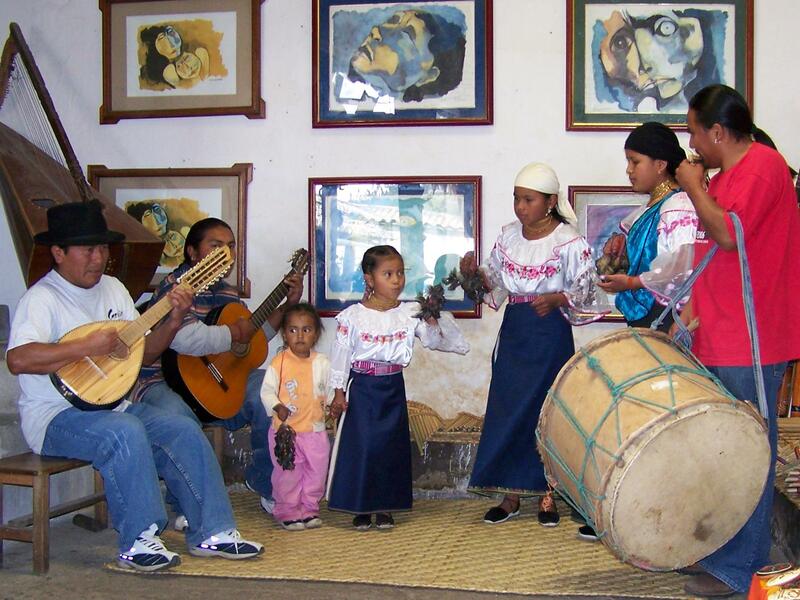 I know this sounds strange but years ago we travelled to Ecuador and at one of our stops was a family showcasing the music of the area. The older children were dressed beautifully and were playing their instruments with their parents. Then, the little toddler came in, clearly wearing her play clothes, and joined in with such enthusiasm playing her goat hoof shaker or chaj-chas. It was completely unprompted and so beautiful of the child and the family to embrace the moment and joy of playing music together. I was very excited to see that Montessori Services sells a goat hoof shaker from Bolivia (item no. M332), as I didn’t have the foresight when I was travelling years ago to purchase one. So with great joy I introduced the goat hoof shaker to A. She was definitely intrigued by the texture and the foreign look of the goat hooves. The simplicity in shaking it to obtain sound immediately brought a smile to her face. She even experimented with it a little by holding it by one hoof to shake it and holding it by the fabric to obtain a different sound. I’m quite certain she will enjoy this shaker for years to come! I look forward to using this shaker as a stimulus for talking about Bolivia and learning about the country together. I think it will also serve as a stimulus for talking about goats and using animal parts in a resourceful manner. Another extension will be to listen to music from the Andes, where she will be introduced to more instruments such as the pan flute and charango. This goat hoof shaker is a very welcome addition to our home and instrument collection! The second instrument I received was a child-sized rainstick from Chile (item no. M448). It is made from a Capado cactus and the pebbles cascade over cactus spines. At first touch I thought it was quite rough. When I gave it to A. though she didn’t seem bothered in the least by the roughness. She turned it over creating a “downpour” effect immediately. She then explored it and any worry that I might have had that the roughness would turn her off from enjoying it was dispelled. I also had another worry that she would be scared by the noise. A. is quite sensitive to sounds and on a previous occasion was quite scared by the thunder of a large rainstick. The child-sized rainstick made just the right amount of noise so that she was intrigued by it and continued to use it. I’m so glad For Small Hands/Montessori Services pays great detail to attention to ensure each item is truly child-sized. In the future, A. and I can explore the country of Chile and the geography of the area, especially the flora to learn about cacti. Perhaps we can get a cacti for her to take of in the future. I wonder if she’ll be bothered by spikes of a live cactus! A.’s favourite instrument was the Tinya Drum from Peru (item no. M350). On a recent trip to the Squamish Líl’wat Cultural Centre A. had a lot of fun playing the drums of our local First Nations in the children’s area. When I gave her the mallet for the Tinya Drum, she immediately began banging on the drum and I could tell this was her favourite. Prior to receiving this drum A. only had a djembe drum which she plays using her hand so the addition of a mallet to play a drum was quite enticing to her. The drum has a little handle, perfect for her small hands, and this allows her to carry the drum around with her. She hasn’t tried playing it while holding it yet, which makes me happy that there are different elements to playing the drum that she will be able to discover in the future. She can enjoy it now in a simple manner and later explore the many ways to have fun with it and create various sounds. The drum makes the perfect accompaniment to the goat hoof shaker as it is also an Andean instrument and uses a different part of the goat, the skin. I love how drums are very international, as every culture seems to have their own drum, no matter where I go. I’m sure we’ll use this drum as a stimulus for learning about Peru and inciting interest to travel to South America. The giveaway will close on Wednesday, September 10 at 11:59PST. Winner must respond within 48 hours of being contacted. Good luck! The giveaway is now closed. 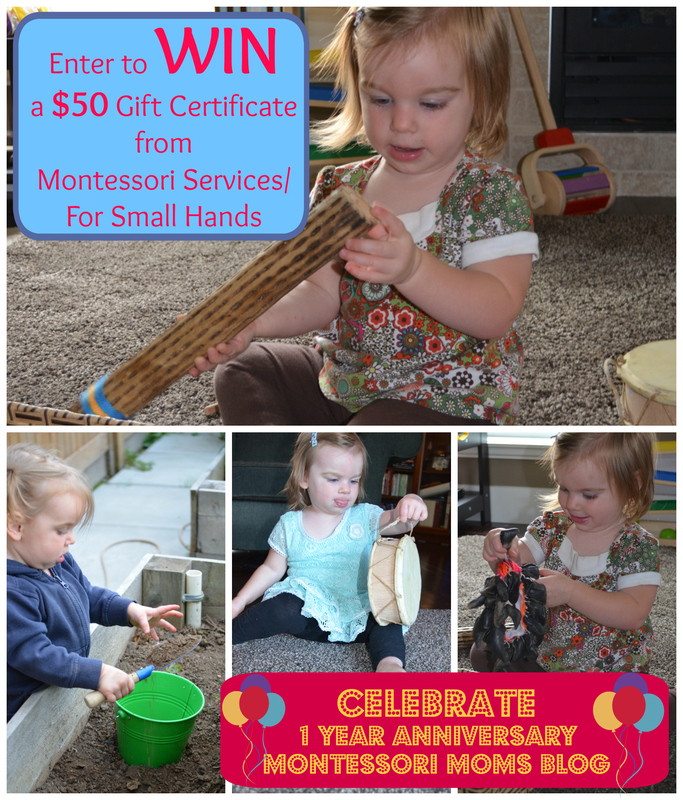 Congratulations to Danielle F. on winning the $50 Gift Certificate to For Small Hands/Montessori Services! Disclosure: The musical instruments shown in this post were sent to me free of charge from For Small Hands/Montessori Services. I was not required to write a positive review. The opinions expressed are my own and were not influenced by any form of compensation. This blog is written with authenticity and honesty. I am pleased to work with For Small Hands/Montessori Services for this giveaway as it is company I highly recommend for quality products, great selection, and good customer service.